Leleiohoku appointed Prince Regent, 1874. 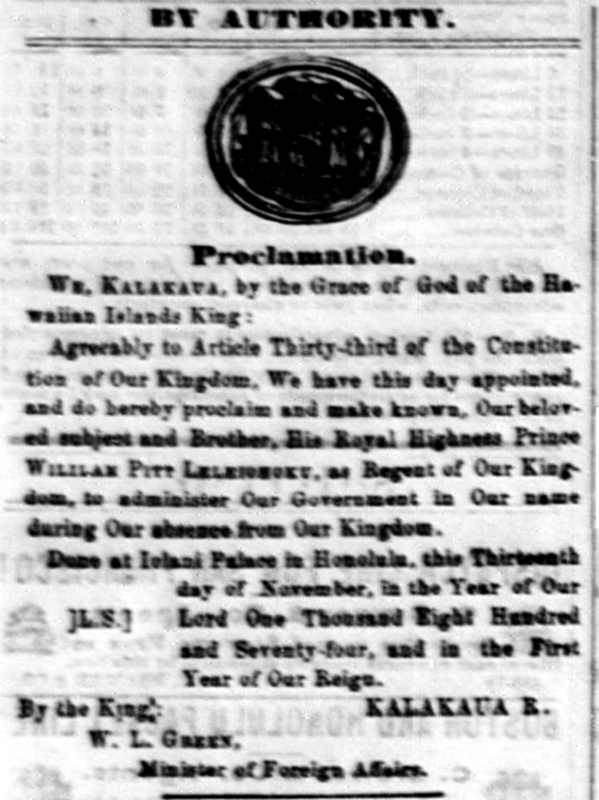 Agreeably to Article Thirty-third of the Constitution of Our Kingdom, We have this day appointed, and do hereby proclaim and make known, Our beloved subject and Brother, His Royal Highness Prince William Pitt Leleiohoku, as Regent of Our Kingdom, to administer Our Government in Our name during Our absence from Our Kingdom. Done at Iolani Palace in Honolulu, this Thirteenth day of November, in the Year of Our Lord One Thousand Eight Hundred and Seventy-four, and in the First Year of Our Reign. Hawaiian Gazette, Volume X, Number 46, Page 2. November 18, 1874. 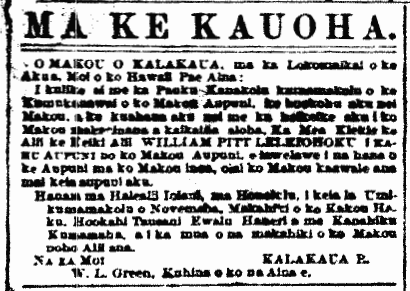 O Leleiohoku ke Kahu Aupuni, 1874. I kulike ai me ka Pauku Kanakolu kumamakolu o ka Kumukanawai o ko Makou Aupuni, ke hookohu aku nei Makou, a ke kuahaua aku nei me ka hoikeike aku i ko Makou makaainana a kaikaina aloha, Ka Mea Kiekie ke Alii ke Keiki Alii WILLIAM PITT LELEIOHOKU i Kahu Aupuni no ko Makou Aupuni, e lawelawe i na hana o ke Aupuni ma ko Makou inoa, oiai ko Makou kaawale ana mai keia aupuni aku. Hanaia ma Halealii Iolani, ma Honolulu, i keia la Umi-kumamakolu o Novemaba, Makahiki o ko Kakou Haku, Hookahi Tausani Ewalu Haneri a me Kanahiku Kumamaha, a i ka mua o na makahiki o ko Makou noho Alii ana. Na ka Moi KALAKAUA R.
W. L. Green, Kuhina o ko na Aina e.
Birthday of the Prince Regent, Leleiohoku, 1875. Birthday of the Heir to the Throne. This coming Sunday, the 10th of January, is the birthday of Prince W. P. Leleiohoku, and he will be twenty years old. He was born on the 10th of January, 1855, on the day of King Kauikeaouli’s funeral, and for that reason, he is called Kalahoolewa. According to what we have heard, the day will be held as a holiday [la hoomanao kulaia]; however, because the day falls on a Sunday, the commemoration will be postponed until Monday, that being the 11th of January this year; and this will be the first time that his birthday will be widely celebrated, for us to give high tribute to the one who is Prince Regent in place of his Brother the King who has left for lands afar. With stirrings of expectation, we are hopeful that this will be a day set aside as a holiday that will be celebrated all over the kingdom appropriately. [King Kalakaua was away from the Kingdom, travelling to Washington, DC, to secure a reciprocity treaty with the United States. Leleiohoku served as Prince Regent during this period from the Kalakaua’s departure on the morning of 11/17/1874 until his return on the morning of 2/15/1875. Ka Lahui Hawaii, Buke I, Helu 1, Aoao 2. Ianuari 1, 1875. A Birthday Feast.—At 3 o’clock on this past Friday, a birthday party was held at Kaakopua, the home of the Royal Governess of the big island, to celebrate the day of birth of her hanai, the one who is named after the day of the funeral [hoolewa] of the departed King Kamehameha III, that is Kalahoolewa. 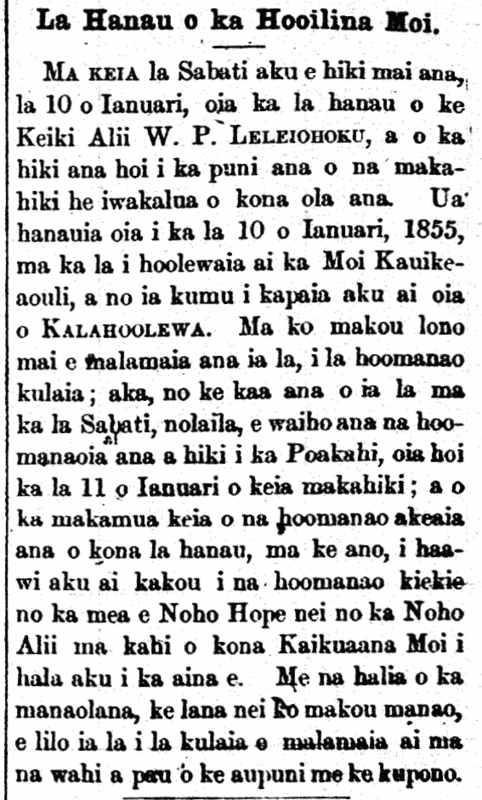 A birthday celebration for Leleiohoku, 1867. Birthday Banquet.—This past Thursday, January 10, a Banquet was held at the residence of the Governess [Kiaaina Wahine] of Hawaii island, here in Honolulu, to celebrate the birthday of this Chiefly offspring, that being Kalahoolewa.